18 questions online test for keyboard combinations. 18 questions online test about file extensions. Computer Navigation Test - IT 9 grade evaluation. Small online test about types of information. 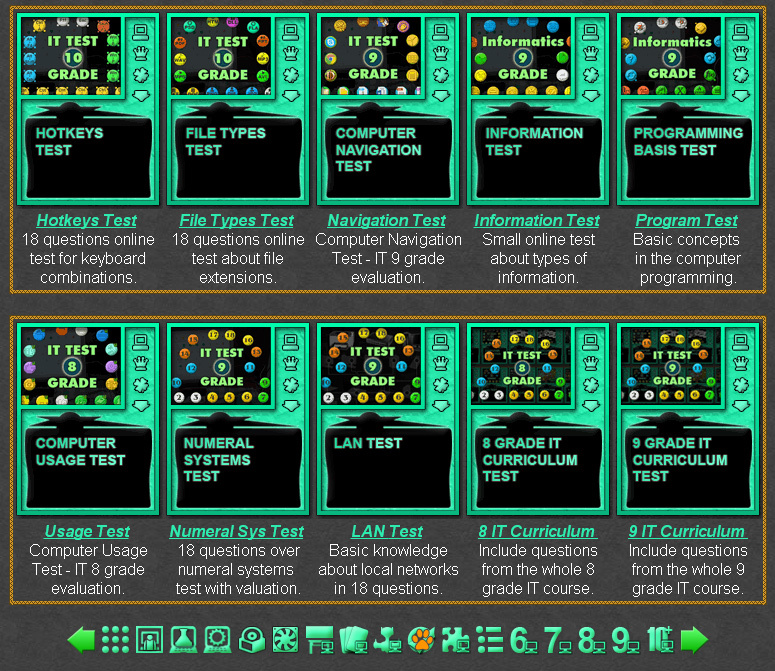 Computer Usage Test - IT 8 grade evaluation. Basic knowledge about local networks in 18 questions. Include questions from the whole 8 grade IT course. Include questions from the whole 9 grade IT course. Fun IT Online Tests Collection. The IT online tests are small flash applications, up to 1 MB, which may be used for evaluation and engaging classes and lessons for Information Technology studies. They are played online in the web browser without any registration. They are usualy cumulative with one of the fun mosaics, folowing their topics, with a 3 answer questions. Every online test is suitable for one or more IT grade, as the school plans may cover the same knowledge for different grades in different countries. These test will save you a lot of paper printing and give you reday school mark when the test is completed. Interactive Computer Tools. Fun Information Technology Tests Collection. Computer Usage Term Test - Solve 18 questions medium online grade test. System Navigation Term Test - Solve 18 questions medium online grade test. Numeral Systems Test - Solve 18 questions hard online grade test. File Types Test - Solve 18 questions hard online grade test. Hotkeys Online Test - Solve 18 questions medium online grade test. Information Online Test - Solve 18 questions easy online grade test. Programming Base Test - Solve 18 questions hard online grade test. Local Networks Test - Solve 18 questions medium online grade test. 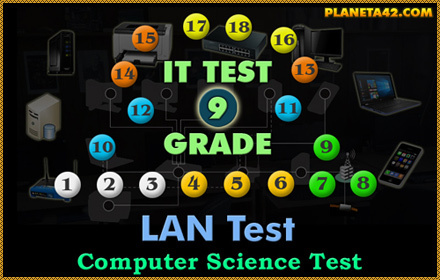 8 IT Curriculum Test - Solve 18 questions online test over 8 grade IT curriculum. 9 IT Curriculum Test - Solve 18 questions online test over 9 grade IT curriculum.